One of my favorite tiara shapes is the kokoshnik, a style popularized at the Russian imperial court of the Romanovs in the nineteenth century. These diadems are meant to mimic the traditional headdresses worn by Russian women, and their half-moon shape is particularly flattering to many wearers. Many royal collections today include at least one kokoshnik tiara, but one of my very favorites is the aquamarine kokoshnik owned by Princess Margaretha of Sweden. It's said that this tiara originally belonged to Margaretha's grandmother, Margaret of Connaught, who was the first wife of King Gustaf VI Adolf of Sweden. To my knowledge, Margaret was never photographed in the tiara, which also has a coordinating aquamarine and diamond brooch. But Margaret's collection was absolutely lousy with jewels, so it's certainly possible that she acquired the piece somewhere along the line. The maker of the tiara is unknown, although I see similarities in the diadem to pieces made by Koch, a German court jeweler. Both the tiara and the brooch feature absolutely enormous aquamarines; the tiara places delicate lattice-like diamond elements in between the large blue stones to form the traditional kokoshnik shape. 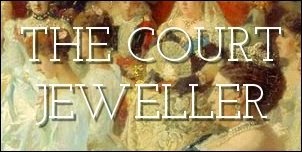 We're probably all familiar with the tragic story of Margaret of Connaught's death, which led to the division of her jewels among her children. If this piece was indeed a part of her collection, it was inherited by her eldest son, Gustaf Adolf, who was expected one day to become king. His wife, Princess Sibylla of Saxe-Coburg and Gotha, was possibly the first person to be photographed wearing the aquamarines. 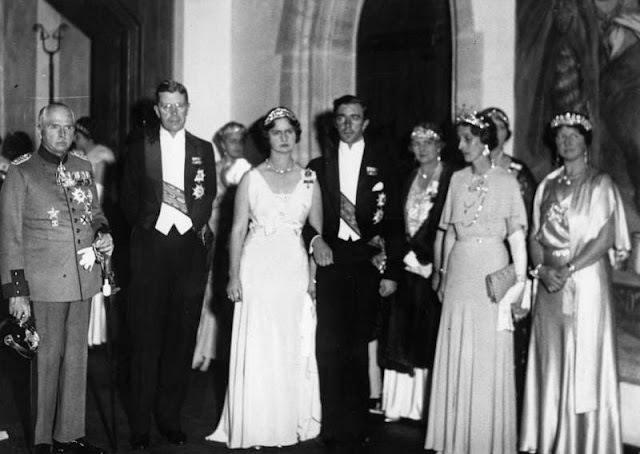 She debuted the tiara at a ball ahead of their civil wedding in Coburg in 1932. Sibylla wore the aquamarines throughout her lifetime, even after the untimely death of her husband in a 1947 plane crash. She was the de facto first lady of Sweden following the death of Queen Louise, and she was regularly bedecked in jewels. When Princess Sibylla died in 1972, the aquamarines were inherited by her eldest daughter, Princess Margaretha. She had worn the tiara even before Sibylla's death; above, you can see her wearing the tiara in 1964. As a young woman, Margaretha wore the tiara on many occasions, including at the wedding of her youngest sister, Princess Christina, in 1974. Margaretha’s daughter, named Sibylla for her grandmother, also wore the heirloom tiara for her own wedding to Baron Cornelius von Dincklage in 1998. After the 1998 wedding, there was a long stretch of time where the aquamarines were not seen in public. Many feared that they had been sold. And then, in June 2010, Princess Margaretha unexpectedly appeared at the wedding of her niece, Crown Princess Victoria, wearing both the aquamarine tiara and the coordinating brooch. The tiara was apparently a last-minute choice for Victoria's wedding; in the press release sent out by the royal court detailing the history of the jewels worn by the king’s sister, Margaretha was noted as wearing the Baden Fringe Tiara. (She did eventually wear the fringe at a Swedish royal wedding -- Princess Madeleine’s nuptials in 2013.) There are persistent rumors, however, the the tiara was sold -- but that the buyer was Margaretha's brother, the king. This theory was bolstered in 2014 when her sister, Princess Christina, wore the tiara at the representatives' dinner in Stockholm. However, Princess Christina has said publicly that Margaretha does still own the tiara but now keeps it in the vaults in Sweden with the rest of the Bernadotte jewels, where the rest of the members of the family have access to it. As Margaretha lives a quiet life in the English countryside, it certainly makes much more sense for other members of the family to get more use out of the piece. Margaretha only wears gala jewels these days when she visits Sweden, so the tiara is there for her to use when she wants, as she did for Prince Carl Philip's wedding in June 2015. And Princess Madeleine has done just that: since December 2015, she has worn her aunt's tiara at the Nobel Prize ceremony, at a tea party for sick children, and in an official portrait. Note: this is an expanded and updated version of a post that originally appeared in November 2014.